Posts are an essential part of all sign programs. 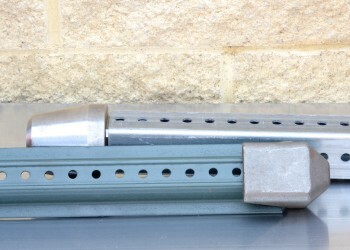 U-channel posts, tubular posts (square and round) and breakaway post systems are featured on these pages. All of the posts and breakaway systems presented here are approved by the Federal Highway Administration (FHWA) and the American Association of State Highway and Transportation Officials (AASHTO). 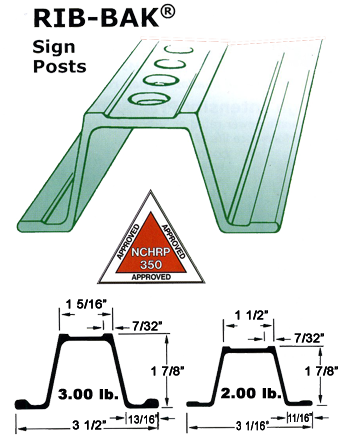 RIB-BAK U-Channel sign posts are manufactured from the finest high-carbon new billet steel (Grade SP-80). RIB-BAK’s patented U-Channel design features a ribbed back and flange which allow for greater strength at crucial load-bearing points. Additionally, RIB-BAK’s back ribs (contact points) are flush surfaces, giving a solid, more permanent sign attachment as well as support for clip-type fasteners. 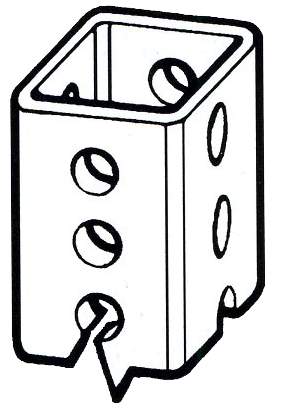 RIB-BAK posts are punched with 3/8″ holes on 1″ centers the entire length of the post. 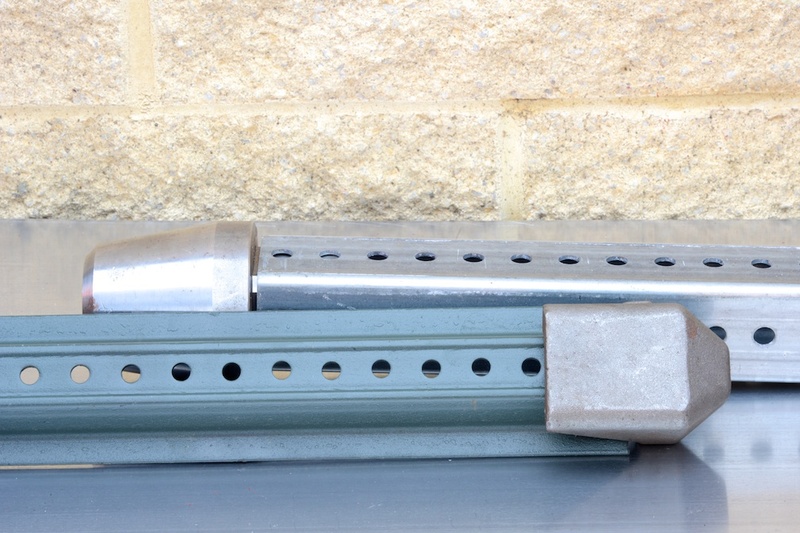 Hot-dipped galvanized to ASTM A 123. Lbs. per foot: 1.12, 1.33, 2, 2.5, 2.75, 3 and 4. Lengths: Powder coat and galvanized posts 3’6″ to 16′. The ULTI-MATE traffic signing support system consists of square, perforated, welded steel tubing, available in to sizes – 1 3/4″ and 2″ square – in 14 gauge material. There are also three sizes – 2″, 2 1/4″ and 2 1/2″ square – available in 12 gauge material. Both gauge s comply with ASTM specification A653. 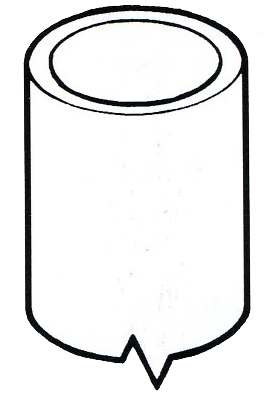 Perforations of 7/16″ diameter are 1″ on center on all four sides. Square posts are hot dipped galvanized conforming to coating designation G-90 for excellent corrosion prevention. Special sizes and lengths available subject to mill minimum. Hot-dipped galvanized steel posts, 2 3/8″ O.D. & 2 7/8″ O.D., are available in 10′ and 12′ lengths. Aluminum posts with 2 3/8″ O.D. or 2 7/8″ O.D. are available in 10′ and 12′ lengths.